Setting up Tír na nÓg Studio has been a dream of mine for quite a while and I am happy to launch it officially on June 17. Tír na nÓg is a wonderful story from Irish mythology, it is a place of eternal youth and beauty where time stand still, no one grows old or gets sick, flowers bloom perpetually, there is no sorrow or pain and where love is eternal. I loved this story growing up and imagined Tír na nÓg to be like heaven. When in the creative process of making a quilt, I can get so engrossed that it does seem like time stands still and all the cares and troubles of the world are no longer present – my little slice of heaven on earth! My quilting journey started about 10 years ago when I went to local quilt store, Eddies Quilting Bee and was just awestruck with the quilts on the walls and the wonderful fabric especially batik. Within a few days I had a new sewing machine, signed up for a beginners quilt class and my obsession with quilting took off. By the end of the 4 week quilt class I upgraded my sewing machine to one with more bells and whistles and before the first year was over I had my own long arm as I wanted to be able to create quilts from start to finish myself. 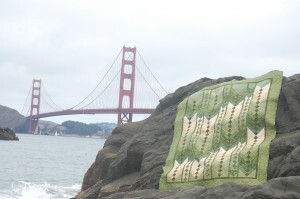 In September 2012 I took an Art and Stitch class and digitizing quilt design became my new addiction. I began seeing quilting designs everywhere I looked and spent many late nights playing with Art and Stitch. I spent lots of these late nights trying to find an easy way to digitize Celtic knots, began dreaming of Irish inspired quilts and Tír na nÓg Studio was born. Here on my blog I will document my quilting journey and in my shop I will sell my long arm and embroidery designs. 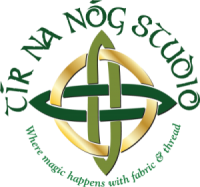 I have big dreams for Tír na nÓg Studio so come back often to see what new and wonderful things I have to offer. Cara’s Baby Shower Quilt – first finish for 2015!